You probably have a resume. If you’ve been at the same job for a number of years, it likely lives in your computer somewhere, in some folder that contains important documents that you never really look at. It’s always a good idea to keep your resume fresh in case a golden opportunity pops up. That way, you won’t be wasting time updating it and fiddling around with the formatting. Don’t waste precious time. When your resume is updated, you can just fire off a cover letter and send your package off to a potential employer in minutes. 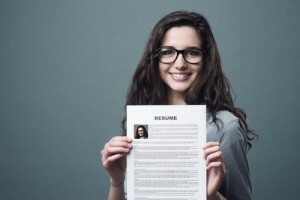 So be ready – the next time you hear of a new job opening at a company you’ve wanted to work for, or meet someone who’s offered to pass on your resume onto their CEO, you’ll have your resume already prepared. Below are four ways to clean up your resume and have it ready to go at a moment’s notice. Cleaning up your resume is like decluttering your home. You want to get rid of anything that’s no longer applicable, fresh, or relevant. If you’re applying for a job in communications, future employers won’t care about the summer you spent cutting lawns. The same goes for jobs in different industries or lesser capacities. If you have work experience, you can delete some of the less impressive content to make your relevant experience really shine. Are you skilled on a computer program that nobody uses? Hit delete. Experienced with darkroom practices? Remove it from your resume. Are you proficient in MS Word? So is everybody else. It’s nice that you have those skills in your back pocket, but potential employers want to know how you can help them. Including irrelevant skills won’t impress them. Were you awarded a key to the city? Recognized as a 10-year volunteer? Received the #1 Sales Manager award? Those are some great accomplishments that show your skill and your dedication. If there’s something that really makes you stand out from the rest, keep it. Make it more prominent on your resume, and point it out in your cover letter. Did your company have the best financial quarter yet due to work that you did? Did you bring honors to your department with an award that you won? Did you lead a project that brought in millions of dollars or lots of publicity? Be sure to point this out in your resume. Check examples of resumes on the Internet to see how others have incorporated this information. It only takes a few minutes, but an updated resume could make all the difference in whether you get your next interview. Do it now, and be ready the next time an opportunity comes your way.